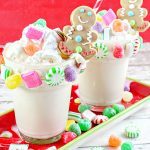 Gingerbread House Milkshake Recipe - A Fun Christmas Freak Shake! Gingerbread House Milkshake Recipe - A Fun Christmas Freak Shake! Indulge your sweet tooth with this fun holiday shake with a candy decorated glass. Gingerbread House Milkshakes are sure to be your new Christmas tradition! 1. Generously apply the vanilla frosting to the rims and top (1-2”) of two milkshake serving glasses. 2. Immediately, apply peppermint candies, gumdrops and old-fashioned holiday mix candies to the frosting. 3. Chill the serving glasses in the refrigerator for at least 20 minutes to allow the candies to harden to the frosting. 2. Scoop the ice cream into a large blender. Add the ginger, cinnamon, nutmeg and allspice. Sprinkle the crushed gingersnap cookies on top. 3. Add the vanilla and milk and blend for 30 to 45 seconds or until completely thick and creamy. 4. Pour the gingerbread milkshake into the serving glasses. Garnish with a generous helping of whipped cream and additional candies. Insert a colorful straw and place a gingerbread cookie on top. ENJOY!! NOTE: These adorable gingerbread cookies were purchased from Dollar Tree. You can find them in a 2 pack cellophane package in the Christmas candy section.